CVS has two swimming pools. The larger of the pools – the “Wanegarden Pool” - is located at 13601 Wanegarden Drive immediately adjacent to the Community Center. 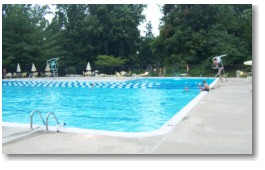 The second pool – the “Winterspoon Pool” - is located at the corner of Winterspoon Lane and Wisteria Drive. The Winterspoon Pool is closed while school is in session at the beginning of the season (between May 25, 2019 through June 14, 2019). During the season, operating hours are subject to change due to swim meets and other community activities. Notices will be posted in advance at the affected pool(s). All CVS homeowners in good standing are eligible to receive pool passes. Landlords have the option of making conveying that opportunity to their tenants during the term of the lease. Applications are generally mailed to each homeowner early in the spring. Watch your mail for the application package. The application documents will be posted below once they are approved by the Board for distribution. Please be sure to carefully follow the instructions to obtain your pool passes without complications.